Home »Comics»Deadshirt is Reading: Rocket and Bug! The Adventures of Forager! Deadshirt is Reading: Rocket and Bug! The Adventures of Forager! If Al Ewing is writing something, I’ll pick it up. Even if it’s a tie-in to a crossover that I’m not following or using characters I’ve never cared about. 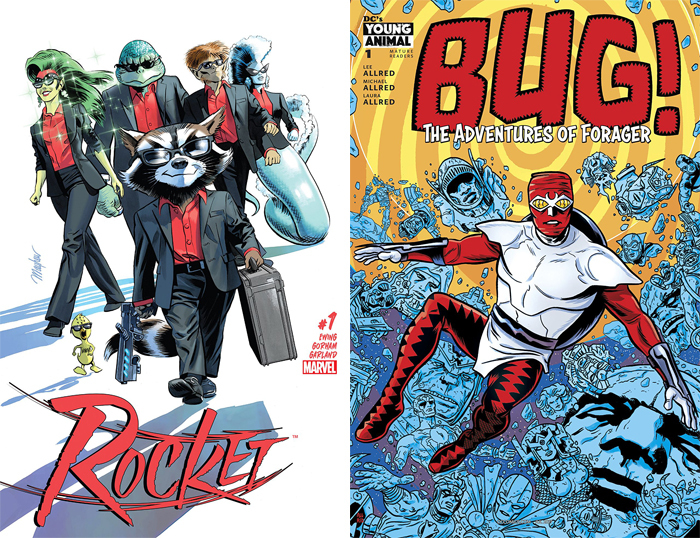 So when Marvel announced that Ewing was writing a Rocket Raccoon heist comic, inspired by the work of Donald Westlake and guest-starring Technet, I was in. I’m not a huge fan of the Guardians of the Galaxy (I enjoyed the movie, but I’ve been uninterested in the comics, to be honest), but I loved Donald Westlake, whether in Richard Stark mode or writing under his own moniker. And I’ve always had a soft spot for Technet, even if it seems like me and Chris Claremont are the only people that feel that way. But Ewing has definitely delivered a great book. Ewing does a great job writing hardboiled crime novel narration in Rocket’s distinctive voice, throwing in Easter eggs for the nerds (Rocket likes a bar because it serves Pan-Galactic Gargle Blasters) and crafting a clever heist for the opening chapter. How can you not enjoy a book where the good guys have to outwit a supercomputer that speaks a faux-cockney dialect? As for Adam Gorham, he’s the perfect choice for this book. There’s a scratchiness to his pencils that makes this part of space feel dirtier than your typical space opera, while still retaining a light touch. He makes Rocket super expressive, which is tricky with a humanoid raccoon. His extraterrestrial character designs straddle that fine line between goofy and convincing. And his pacing of the heist sequence is superb. I’m definitely checking out Gorham’s prior work after reading this. Marvel’s had a lousy record with letting books build audiences these days, and its love of flooding the market with product around movie releases often means relaunches and cancellations before books find their footing. But I already know that I’m down to read this book as long as it lasts. DC’s Young Animal brand continues to impress me with its unique takes on bizarre DC properties. I give anything utilizing Kirby’s Fourth World characters a shot, so this week I scooped up Bug! The Adventures of Forager. Bug picks up some years after the character was killed off in a 1980s DC crossover event (where he has been avenged by Batman). He finds himself in a “house of mystery” in which he stumbles across a ghost girl who quotes Camus and doles out life lessons. Forager eventually runs aground of the original Kirby Sandman and his assistants Brute and Glob. Apparently, the character didn’t actually die but was just sleeping and entered the “dream stream” guarded by Sandman. It’s a really humorous issue and contains tons of references to Kirby’s works and DC mythology. What’s really awesome about this book is how the Allreds nail the tone, dialogue, and art of an 80s Kirby book while also modernizing for new readers. Forager is immediately a likable character from the jump, and the book’s pacing is frenetic from cover to cover. The art even emulates Kirby’s art style with much more emphasis on outlines accentuating the characters. There’s a great panel where Forager is standing amongst a sea of dominoes laid out in a Mother Box diagram. This book is so chock full of DC Easter eggs and references that each panel is its own reward. However, it is just as accessible for new readers who want to take a deep dive into DC’s more obscure yet still important ephemera. Also, I’m not sure if this rogue has appeared before but I need to know more about Sandman villain General Electric because that’s a great name and a great design. He’s basically Dr. Z with a lightbulb head.